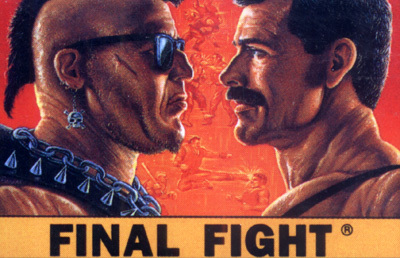 Final Fight was originally released as an arcade game which featured very large and detailed sprites for its day. It features long levels populated by crowds of enemies using various fighting tactics. The story of Final Fight involves the abduction of Mayor Mike Haggar's daughter, Jessica, because he would not work with Mad Gear to ensure their dominance of the streets. The original version of Final Fight for SNES did not feature the "Guy" character, and it was quite the outrage. Capcom released another version on SNES entitled "Final Fight Guy" which included the "Guy" character. However, they removed "Cody" in that version which was only released as a "rental" in the US and never saw actual retail release. A more perfect console port of the arcade version is available on the Sega CD system, featuring all 3 characters, more animations and refined sound.